Pflugerville First United Methodist Church has a long tradition of serving the community, starting with our neighbors here in Pflugerville and extending to mission projects around the world. Service and missions projects showcase our faith in action. Jesus said “follow me,” and told us to “go,” simple but direct words that have helped move our faith around the world. What Linda and I like about this church and why we think it is an awesome church is because there are a lot of quiet Christians who go to this church and just get things done. Linda and I talk about all the people we know who are doing volunteer work in the community. Some do Meals on Wheels, food pantry, Stephen ministry, Drive a Senior, feeding the homeless, teachers tutoring in the schools, etc. They don’t ever say anything about it. They just go and do it! To us, that is faith in action. They don’t want credit, but they see a need and try to fill it. That is what we like about this church. It gets things done quietly. Church secretaries have been vital to the ministry of PFUMC from the beginning. Initially the functions were provided by volunteers, but by the time Rev. Karen Vannoy came in 1984 it was recognized that the church needed paid staff, and Ruby E. Trombley was hired part time. In the beginning the role was primarily helping the pastor, record keeping, and communicating with the congregation in a newsletter and in other ways. I was laid off from a tech sales position at the end of 1986, and Rev. Jim Cloninger offered me a lifeline to be the church secretary—a part-time position that paid $400 a month. I jumped on the offer and filled the role for several months. It was back in the day of typewriters. If that doesn’t say loads for job description, what does? Typing the minutes to all administrative council meetings, church newsletters, and Sunday bulletins without the use of a computer. I made hard copies of everything because nothing was digital. I had a cramped office and a job description that implied it would be helpful if the lawn was kept mowed too. The pay didn’t include a 401k plan, but no one kept track of the coffee I drank. My husband, Mike, and I have been members of Pflugerville First United Methodist Church since 1985. Before our son, Chase, was born in 1988, I took a leave of absence from my teaching job to care for him full time. Wayne Moore, who was secretary at PFUMC at the time, was planning to move on, and I was asked to fill the part-time position. I was able to bring our baby to the church office each morning, and he usually slept while I answered phones, typed the bulletin, wrote the newsletter, etc. Everyone who came to the office for whatever reason was very kind and understanding about him being there. As a new mother, I received and appreciated advice from more experienced parents, and Chase was better off for it. During this time in the church’s history, money was very tight. Instead of a custodian, members signed up to clean the church building. Membership may have been low, but determination was high, and everyone pulled together. While I was secretary the pastor, Jim Cloninger, got married. The entire church pitched in, extending the stage on both sides and installing carpet to this area and the aisle. It was a special event in our church family, one in which we all took part. It was the joy of my life to be church secretary. I loved every part of it. My husband, Henry, traveled quite a bit, and my children were teenagers or in college so I had the time to spend there, and I wasn't working to make a living so the salary wasn't important. I had an inside view to the kindness of all who went to church there and was able to witness most everything that people volunteered their time to do from keeping the church clean to keeping the grounds manicured. The main core group of the church made sure that the needs of the church were met. I remember that when I first started going to church there that out in the narthex was a bulletin board with bills posted that needed to be paid and the members would contribute and make sure that these obligations were met. That probably was unique to our church, but I know that it made the congregation have a sense of ownership and togetherness. People would stop by the church just to talk, and it was my pleasure to do so. Sometimes they would thank me for listening, but what they didn't know was that they were helping me more than I was helping them. Jim Cloninger—Jim's daughter Elisabeth was best friends with my daughter Jill and she invited us to church. Jim and I became friends because of our daughters. What a special person he was. He was the perfect person for the Pflugerville church at the time he came. He worked hard at bringing the church together as a family and was very present in the workings of the church. Jim Harrell — retired Marine colonel and very giving of his time and money to the stability of the church. He was a treat to see in action behind the scenes. Some mornings when he would come by my desk to check in I would say "do we have the Marine or the pastor today?" which he found amusing. He was more than generous—as I used to say, he paid the church to work there. Walt Mattison — He and Jim worked well together, and he was a pleasure to work with. His wife, Gwen, was also very helpful to the ministry of the church. Frank Wolf — Frank and Marian were quite a pair and were really helpful at building the church membership. They both worked at establishing ministries outside of the church such as Kairos and Walk to Emmaus. The ministry and purpose and who the church serves is best told by the founders of the church. I know that I was moved by the stories of the vision of the Shires to start a church in Pflugerville because of the need for a Methodist church. Those who started it were "the church." All of their blood, sweat, and tears went into the beginnings of the church, not to mention monetary contributions. They tell of stories of hanging cabinet doors, painting the cross and flame on the front of what is now the Family Life Center, building choir lofts, and on and on. It truly was a work of love and commitment. In 1998, when Rev. Frank Wolf was pastor, I was hired as church secretary. When I started working here in 1998, I was only part time (9 a.m.–2 p.m.). We only had 376 members in the church at that time. It wasn’t too many years after that when the SPRC decided I needed to work full time. Worship was still meeting in the Family Life Center (then the sanctuary) and the administration building was newly built, and the offices were moved in there. I’ve seen a lot of changes to the church campus—from building the sanctuary and education buildings to clearing out trees when we purchased the cotton gin property. In 2010, Rev. Monte Marshall and the SPRC changed my job title to office manager. Office duties have increased over the years—updating the website, taking over calendar duties, scheduling events and weddings, setting up classrooms for various meetings, maintaining the Pastor Discretionary Fund, becoming a notary for the church, managing the custodial staff, managing the thermostats, etc. Besides office duties, I’ve found myself mopping up hot water from a broken heater in the kitchen, helping to clean up messes around the campus, setting up classrooms for meetings, plunging toilets, and picking up dead birds/animals. I change the street sign, and on numerous occasions (before Pecan Street changed) had to go and find letters/numbers that got sucked out of the sign when large trucks drove by. A key ministry is helping folks; i.e. financial assistance, giving out food, receiving clothing for the closet. I have had money stolen from my wallet by the wife of a man I was helping in the other building, chased down a gentleman who was trying to steal a wagon from the church, had an elderly gentleman try to show me his hip surgery scar to prove he needed financial assistance, visiting people in the nursing home or hospital, going to a person’s home to help them. I have been told by many people that I am a prefect fit for PFUMC, and I must admit that I have been blessed to be allowed to serve here. I truly love many of our congregants, the beautiful campus you have built, and sometimes the unorthodox happenings here. Often the church secretary/office manager is taken for granted, that is until she/he goes on vacation and someone else tries to fill in while they are gone. Some people think that her role is the complaint department, but she has to let the complaints roll off and see the heart of the staff and other people she works with. The key role of the church secretary is to enable vital church ministry. She is a quiet disciple dealing with members and guests in multiple ways to make ministry happen. Backpack Pfriends is one of many outreach/mission projects in which Pflugerville First United Methodist Church (PFUMC) has participated over its history. PFUMC partners with Pflugerville ISD through Backpack Pfriends to serve hungry children in the district. More than 10 years ago, two longtime church members, Paula Harnsburger (affectionately known as “The Little General”) and Vicky Esparza-Gregory (lead social worker for PISD), began partnering with Copperfield Elementary to provide food-filled backpacks to students in need each weekend. They coordinated the program with the school’s guidance counselor and worked together for several years. After Paula’s death, the partnership ended. The following school year, a PFUMC-affiliated Bible study group accepted the call to feed hungry children in PISD. After completing several different mission-focused studies; the Tuesday Night Bible Study group was looking for opportunities to serve others in our community. Jessica Kennedy, PFUMC member and teacher in PISD, shared stories about one of her students who was frequently hungry. He stated that there often was little food in his home and his student meal account was seriously in arrears. After hearing his story, the group donated enough money to bring his account current and leave it with a positive balance! Renewing PFUMC’s partnership with PISD and the Backpack Pfriends program was a natural next step. Jessica, a teacher at Pflugerville Elementary (PES), worked with the guidance counselor at PES to get the program up and running. Forty-six students were served the first year! Midway through the first year with Backpack Pfriends, PFUMC’s Young Adults group joined in the mission and remained faithful partners through the spring of 2017. The PFUMC Tuesday Night Bible Study group is now in the sixth year of providing weekly supplemental backpacks of food for students at Pflugerville Elementary. They lovingly and devotedly provide food each weekend for children who might otherwise go hungry. Backpack Pfriends and the Tuesday Night Bible Study group have been blessed by donations of cash and food from other church members. Recently, the PFUMC choir joined the project to help feed students at PES. Over the years, PFUMC, through the Tuesday Night Bible Study and other small groups, has partnered with PES to feed more than 200 students! Through the stewardship of Vicky Esparza-Gregory, additional PFISD/church partnerships have grown and Backpack Pfriends is now present in nine PISD elementary schools. You can learn more about Backpack Pfriends in PISD by clicking on the following link http://www.pfisd.net/domain/1321. Pflugerville FUMC has several mission projects that serve students returning to school in the fall. At the start of the school year our congregation provides clothes and supplies to help schoolchildren. The Servant Angels designate a Sunday for members to purchase blue jeans and underwear and bring them to worship. The congregation also donates school supplies to fill a school bus. Before school starts children and teachers are invited to bring their bags or backpacks to church. These along with others that the congregation purchases for children in need receive a blessing. If they don’t bring in a bag, they can pick up a tag for their bag that says it has been blessed. It is a way for students of all ages as well as our teachers to know that their church family is thinking of them throughout the school year. More than one college student has taken one of those tags across the state or country, keeping a reminder of their home church close at hand. 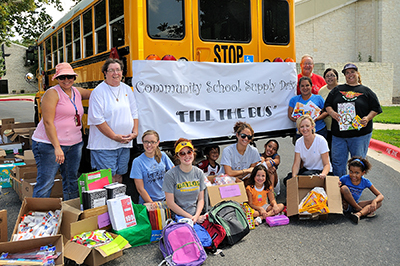 Pflugerville ISD has been the recipient of backpacks, school supplies, and Undie Sunday events for many years. The students and their families benefit from obtaining these resources before school starts. We serve over 250 students each year. Families are very grateful for the extra support during this time of year as they get their children ready to start school. As a result of the donated resources, families are able to designate their funds for other items they may need for school. Thanks to blue jean Sunday, new and gently used jeans are given to students throughout the course of the year. The church also partners with the district to support families in homeless situations. The district social workers are able to obtain food resources from the food pantry Monday through Friday for the families they work with during the school year. The church also provides support by allowing district social workers to use meeting space in a classroom to hold meetings with parents. Meals on Wheels, Senior Access (Drive a Senior), and Grand Adult Day are ministries to senior adults to allow them to stay in their homes with some independence. Meals on Wheels volunteers at our church were organized by Ted Shaw to deliver hot meals to homebound seniors. Some of the early volunteers were Emmett and Carolyn Eary, Georgia Duncan, Bobbie Whitwell, Rachel LaPoint, Sandy Tolleson, and Ted and Kathy Shaw. Pat LaSalle and Mimi Constantino have also been organizers. There have been 20 to 25 volunteers who provide delivery during lunchtime on Tuesday, Wednesday, and Friday each week. The team has changed through the years but not the mission. People go in pairs, pick up the meals in a central location in Pflugerville, and deliver them to six to ten homes. In addition to a hot meal the recipients have a little daily contact with someone who cares. Senior Access, formerly known as Drive a Senior–Senior Access, provides transportation and support services to seniors in Pflugerville, Round Rock, Hutto, and East Austin. Our church members have volunteered to drive seniors to medical appointments, shopping, and errands so that they can remain independent in their own homes. Serita Lacasse, the director of Senior Access, is a member of our church. Emmett Eary was an early leader of our volunteers. Others who participated were Quincy Morris and John LaSalle. Grand Adult Day is sponsored by Senior Access and invites seniors in the Pflugerville and Round Rock area to our Family Life Center to visit with friends, have lunch, and play games. Denise Cornelius coordinates the scheduling and John LaSalle sets up the tables. Emmett Eary was involved with organizing Grand Adult Day in the beginning. Once a month worship is provided for residents in a Pflugerville nursing home. There is usually a devotional and singing old familiar hymns. The residents sing along with joy. Paula Harnsberger had a passion to feed those in need. She began asking her fellow Servant Angels to donate cans of food in the early 2000s. She would put bags of food together to give out to people that came to our church for help. She never stopped finding ways to get people of our church involved in donating. As things progressed she acquired a room in the Family Life Center and began filling the tiny closet with food. In 2004 she started working with the Capital Area Food Bank, where the pantry could buy food for pennies on the dollar. The congregation donated money and food to support this ministry, and the food pantry exploded in growth. The pantry then moved to a larger room in the Family Life Center. Many church members helped put shelving together and do the other work to turn the new room into a great food pantry. After Paula was unable to lead the pantry, there were many wonderful people who stepped up and took over. When Paula passed away in 2010, there was no question about dedicating the pantry in her name. We were all proud to name it Paula’s Food Pantry. Today we are still going strong with many fantastic volunteers, and in 2017 the pantry served 4,756 families, 19,722 individuals, and 332 new clients. In 2017 the food pantry adopted a mission statement: From the overflow of the love of Jesus Christ we serve our community by providing food assistance to those in need. The pantry continues to evolve to this day. In addition to church members, small groups and Scout troops collect food and make donations to the pantry. Paula was always willing to meet with groups to explain the pantry’s work. Through these efforts, and in her honor, we continue to make a real difference in the community. Pastor Wade Lindstrom led the effort to have Go Day at First UMC beginning in 2013. Go Day, usually held on a fifth Sunday, is a day of community service. Instead of a traditional service with a sermon and music, the congregation goes out into the community as a church and performs acts of service and kindness around Pflugerville. Go Day projects are planned for all ages and abilities. Our preschoolers have worked at the church to assemble mercy bags for the homeless, while other church members have left the campus to take food to the homeless, bring cookies to first responders, and do other jobs throughout the community. Members have handed out bottled water on the hike and bike trail and at Lake Pflugerville and have made toys to take to the animal shelter. Go Day is a fun way for us to remember that we are called not just to go to church, but to BE the church, and Go Day sends us out into the world to do that. I first donated blood in college in 1973 and regularly donated when presented with opportunities. After I arrived in Pflugerville in 1983 I became more disciplined with donations and encouraged co-workers to join me. At some point I learned the blood center would come to a group so I asked Pastor Jim Cloninger if FUMC would host a drive. Rev. Jim said sure, but I had to do the recruiting or it wouldn't be successful. In my phone call solicitations, I often introduce myself as Vampire Wayne. At our last blood drive on February 28, 2018, the blood center posted a sign thanking me for 30 years of organizing these drives. FUMC has given over 600 units of blood with some of our regular donors giving for 30 years with me. Back in my earlier days, I bought into the gift of life a blood donation can mean. I wasn't just doing it for the cookies. The specialness of this mission hit home two years ago when my wife became ill and needed several transfusions over the course of a year. Thank you church family who have supported this mission with me. Cory Monzingo’s family and friends established the Cory Monzingo Memorial Scholarship at First United Methodist Church of Pflugerville to remember and honor Cory. The Cory Monzingo Memorial Scholarship is awarded to students each year that have been active in the youth group of First United Methodist Church of Pflugerville. The first Cory Monzingo Scholarship was awarded in May 2013. Since then a minimum of five scholarships have been given each year. There have been over 25 recipients and over $30,000 given to date. 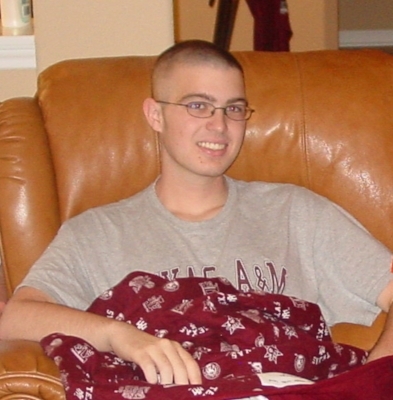 Cory was diagnosed with Desmoplastic Small Round Cell Tumor (DSRCT) in October 2008 at the age of 19 as he was beginning his sophomore year at Texas A&M University. Cory’s 27-month battle against DSRCT included many chemotherapy and radiation treatments, surgeries, and medical procedures. Cory fought bravely against DSRCT and never gave up hope or faith that he would someday win his battle. He was an inspiration to those who walked this road with him, and he understood the unfairness of this dreadful disease but never complained or allowed bitterness to enter his heart. He instead chose happiness each day and continued to live life to the fullest despite much suffering and great hardships. Cory passed away on December 15, 2010, surrounded by his loving family. There is much desperate need for people who are devastated by hurricanes, wildfires, and floods. PFUMC has worked in many ways to provide help in disaster relief and recovery. We have supported the United Methodist Committee on Relief (UMCOR) with our contributions and with numerous flood buckets to provide immediate supplies for cleaning and relief after a disaster. Our members purchase the supplies and fill buckets to be delivered after a disaster. UMCOR provides relief, response, and long-term recovery aid. We personally get involved with Early Response Teams (ERT) to help provide disaster relief on site. We provide emotional support as well as the physical labor to clean out houses, remove wet furniture, carpet, insulation, and wallboard. These have included the Bastrop wildfire relief in 2011; the flood clean-up in Austin along the Colorado River and in Wimberley in 2013; and the Hurricane Harvey relief along the Colorado River and the Texas Coastal Bend area in 2017. Four teams were deployed in 2017 and some individuals worked independently many days also. Teams were led by Jack Foreman, Donn German, and Clark Meier. One family of three females whose house had been flooded told us that we were the answer to her prayers and her angels. There is no way she could have done all of the work. Emmett Eary and Jack Foreman have been disaster coordinators for the Capital District and for the Rio Texas Conference. They have provided ERT training in our conference. Our church has over 50 people ERT trained and a trailer equipped with tools and supplies ready to deploy. We also work to help recover from disasters as a part of United Methodists Volunteers In Mission (UMVIM) in teams like ERT but with the purpose to build up the homes and make them livable again. This is long-term effort and support. The ministry of serving food to the homeless began in 2011, after Lent, when the congregation was offered an opportunity to join a new group called Beyond the Boundaries. The group was formed and led by Pastor Monte Marshall. These disciples (which included Tommy and Marilyn Horndt, Carolyn Sill, Wendye Mire, Hillarie Smith, and a few others) had a desire to go “beyond the boundaries” of the church walls. As a group, they prayed about what was out of their comfort zone and from those prayers put serving the homeless on their hearts. For almost a year the group served the homeless of Woolridge Park in Austin. A meal was prepared (hot when possible) and served once a month. A great deal was learned during this time about those living on the street, such as how they looked out for each other, only took what they needed, the use of resources of the community for assistance and how very appreciative they were for the interaction—human contact with a handshake or hug was priceless. Some were willing to become relational, some were not. Communion was shared on several occasions, which was very special for the servers and those being served. Wooldridge Park closing and city regulations caused this ministry to stop. Instead the Beyond the Boundaries group serves meals to 12–15 homeless people a month on the I-35 corridor closer to Pflugerville. Mercy bags prepared by the Servant Angels are distributed also. The group members changed over time, and with the departure of Pastor Monte there was a transition of members. There are many wisdoms that are spoken during our interactions, but the one that stands out to me is a very kind older gentleman. After talking a few minutes and giving him a hot meal I parted saying, “God bless you,” to which he replied, “He just did!” It was a God moment and His presence was most certainly felt. In December 2014 Pastor Wade Lindstrom started the tradition at PFUMC of having a miracle offering. The basis for it was that Christmas was not our birthday, and we were challenged then (and each year since) to match our personal spending with an equal donation to the miracle offering. The focus has always been to have the miracle offering leave the church to support ministry outside our walls. There are two missions that have been served by the miracle offering—they are supporting the Mulungwishi Katanga Province of the Congo and Habitat for Humanity. Tom Stanton with the Southwest Texas Conference (now Rio Texas Conference) who visits the African community each summer, educated our members on the need of prenatal vitamins to help alleviate high infant mortality in 2014. As the church learned more, it was discovered that the wives of the clergy also needed sewing machine support so that they would have a useful skill to support the husbands and their community. A part of our Christmas miracle offering supports health initiatives, supplying children vitamins as well as neonatal vitamins and helping women with sewing skills and other educational opportunities. In 2015, the Mulungwishi women, in appreciation of our gifts to them, sewed a beautiful shirt given to us. It doesn’t take long to see the photos and videos to know they are a kind and joyful village appreciative of the love shown to them. In 2017 we were blessed with a visit from Pastors David and Lori Persons. They shared stories of their ministry with the congregation. It was wonderful to be able to understand their experience. Spreading God’s love to all ends of the earth is our calling. Helping the people in Mulungwishi has been the first overseas mission we have supported financially. Tom has invited the congregation to join him on a summer mission trip, but no members have been to date. Habitat for Humanity’s mission is “Seeking to put God’s love into action, Habitat for Humanity brings people together to build homes, communities and hope.” Their vision is “a world where everyone has a decent place to live.” Habitat for Humanity has been building homes with volunteers since 1973. Every two years approximately 13 Methodist churches in the Austin area come together to provide the funding and manpower to build a home for a family. In 2013 PFUMC joined the “Methodist Build” group supporting the build with volunteers and $6,000 for the home materials. Wendye Mire and Jack Foreman coordinated our church’s involvement. We have participated in two additional builds (2015 and 2017), and plans are to continue supporting this very meaningful ministry. HFH requires the support of the entire congregation to provide volunteers to help build the home. It is a very rewarding experience to have the opportunity to meet the family and work beside them to build their home. Thousands of people in Uganda suffer from a foot parasite called jiggers. Through education, medical care, and shoes Sole Hope seeks to aid Ugandan people to become jigger free. Though jiggers are a complex problem, the solutions are simple and can change a person’s life forever. FUMC learned of this ministry from Kelsye Mire Jones in 2016 after she participated in the ministry in Nashville. While seeking a family friendly ministry for Go Day we learned of the ministry. It was a perfect ministry to have our FUMC families join with SoleHope. SoleHope has several ways to be involved in the ministry. We chose to help by receiving a pattern for a certain size of shoe and cutting the provided pattern from an old pair of blue jeans. Of course this took many donated pairs of old jeans from the congregation and lots of folks cutting out jean patterns. Once all the parts of the shoes were cut out they were shipped back to SoleHope with $10/pair of shoes. The money offsets the cost of mailing the shoes, the tire rubber for the bottoms of the shoes as well as pays the Uganda workers a small wage to make the shoes. SoleHope encourages small groups to host parties to collect and cut out jeans for the shoes as a ministry. We have had several PFUMC groups participate in SoleHope after Go Day, and that is what spreading God’s love is all about! PFUMC has long been involved with the Kairos ministry. Kairos is a ministry to prisoners that has some similarities with the Walk To Emmaus spiritual retreat with some notable differences because the participants are in prison. Rev. Frank Wolf had been involved with it before he came to PFUMC and continued while pastor. Liz Klar served on many teams and tells about it on the pastor page. Other pastors like Monte Marshall and Wade Lindstrom served also and recruited laity to participate with them. An example of Kairos is from Rob Turk, who in December 2017 was a member of Kairos 64 team. He described the mission. The team first went through safety training at Texas Department of Criminal Justice facility in Bryan but didn’t interact directly with any prisoners at that time. Kairos 64 was held at the Ferguson Unit of the TDCJ prison outside of Midway, Texas. This facility is a maximum-security penitentiary located about two and a half hours east of Austin. There are approximately 2,200 inmates there, 300 trustees, and about 500 staff members. Part of being on a Kairos team includes preparing home-baked cookies to be shared with all of the prisoners and guards and staff, so members of PFUMC helped provide about 140 dozen cookies for the weekend. Rob said, “As I entered the chapel, there were about 50 'Brothers in White'” who were the stewards and trustees supporting the ministry in the chapel. They greeted me like I have never been greeted before, and welcomed me. I immediately felt wanted, loved, appreciated, supported, safe, and encouraged. Then the candidates were welcomed just as warmly. Over the course of the three-day weekend, these men who are all broken, battered, and used to being mistreated opened up about life, God’s love, and they expressed a lot of awe and appreciation for the love shown to them by the volunteers, and the food, and especially the cookies. They cried when they tasted fried chicken and brisket and especially pizza that we brought in. They were real with us about the choices that got them locked up and genuinely expressed remorse for the things they had done. Then they proceeded to amaze me. Here they are, locked up in a maximum-security prison, and they went out of their way to pray for homeless people who are out on the street, and for kids, and for orphans and widows. I was blessed to get to walk the cell blocks and hand out all the cookies to the prisoners who were not involved in the Kairos weekend, and told many of them that God loves you, Merry Christmas, Jesus loves you, and God bless you. They were very happy to receive the homemade cookies. I delivered cookies to a segregated block where I was supposed to be wearing a flak jacket and eye protection and told the men there that God loves them. They were stunned to see me there and to hear that good news. I went to Kairos expecting to minister to the prisoners, but as it turned out I was ministered to and felt a level of joy and appreciation that is very rare in life. If our churches had a fraction of the energy and excitement that we felt at Kairos 64 our services would be standing-room only and there’d be a line out of the door for people to get in and get involved. If you are looking for a spark in your spiritual life, I cannot recommend Kairos prison ministry more, as the experience was just outstanding on every level, and a true blessing to me. The inception of Pecan Street Preschool was both a dream and a vision that came together at the new member luncheon in February 2002. Briana Roehling and Robin Jalufka met and in a few weeks, the inception of the preschool began. Pecan Street opened its doors to the Pflugerville community in September of 2002. The purpose of the preschool is to provide children ages two to five with an atmosphere of love, conducive to creative play and exploration of the child’s world. The church offers this program out of its basic belief that God is a God of love and that children should have the opportunity to experience this love through relationships with others within a positive learning environment. In the beginning, we had two classrooms with only 15 children and three staff. The administration building was where we met. Growing each year to fill more rooms, the preschool then expanded to the back parking lot by renting two large, two-classroom portables. Upon opening the new education building in 2012, the school started filling all but two classrooms. It was then that the name change came into effect to Pecan Street Christian School (PSCS). Within the first year, we had another dream to offer private kindergarten. With only three students the first year, we grew each year now capping out with 12 kindergarten students enrolled for next fall. PSCS currently has 128 children enrolled in our school with 16 staff. We are so blessed by the dedicated staff and families of our preschool and by the support of our church. What makes our program unique is that we have families from all nationalities and denominations coming together to share God’s love. Our goals are to create an environment where children know they are special, know they are loved, and are surrounded by positive encouragement. Our school did a few extra things this year. We raised funds for “Trinity by the Sea” preschool in Port Aransas after it was devastated by Hurricane Harvey. We hosted a pancake supper where our families were able to meet each other outside of the school. We participated in the Big Event with students from the high school coming to “beautify” our campus, now an annual event. Our kindergarten and pre-K friends go over to the FLC and share special times with the Grand Adult Day that meets quarterly at our church. Welcoming new families to our school and church were a vision seventeen years ago that continues to still bless us all. Thank you for your continued prayers and support for this very vital ministry of PFUMC. May the Lord continue sending children and their families our way.